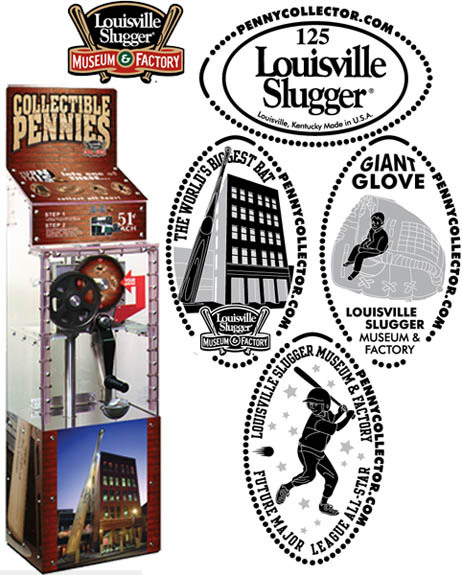 The Louisville Slugger Museum & Factory, a museum located in Kentucky s "Museum Row" in the West Main District of downtown, showcases the history of the Louisville Slugger brand of baseball bats made by Hillerich & Bradsby, and of baseball in general. Inside the production of the bats is presented, along with historical examples of bats (such as an 1880s Pete Browning bat they recently discovered or the bat that Babe Ruth used to hit his last home run as a Yankee). Outside is a steel replica six-story bat that seems to be leaning against the building. The building also serves as their corporate headquarters and a production facility. New machine placed in the museum November 2012 4 die pennyman machine.